Our homemade Russian Dressing is tangy, slightly spicy, and seriously addicting! 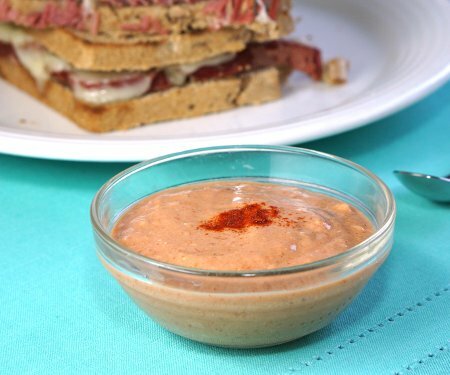 It’s the perfect sauce for a Reuben Sandwich and more! What’s The Difference Between Russian Dressing And Thousand Island Dressing? Thousand Island Dressing and Russian Dressing are incredibly similar, but there are a few key differences. 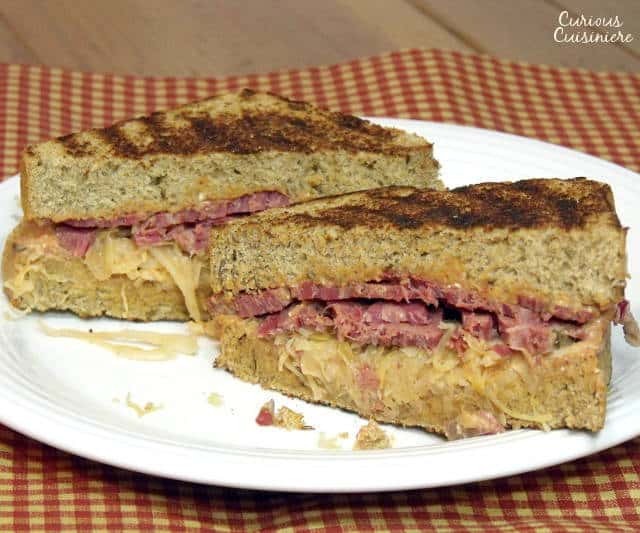 What Is The Sauce On A Reuben? The names Russian Dressing and Thousand Island Dressing tend to be used interchangeably nowadays. 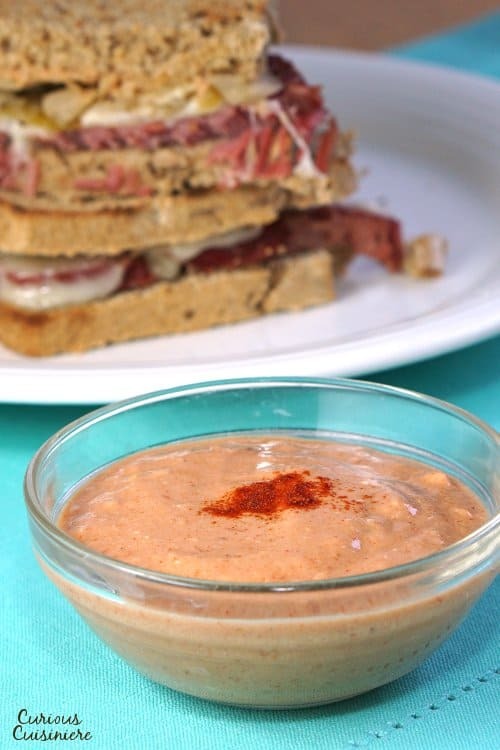 Because of this, many restaurants just serve their Reuben sandwiches with Thousand Island Dressing, since they often already have it on hand. But, Russian Dressing was the staple that made the sandwich famous. 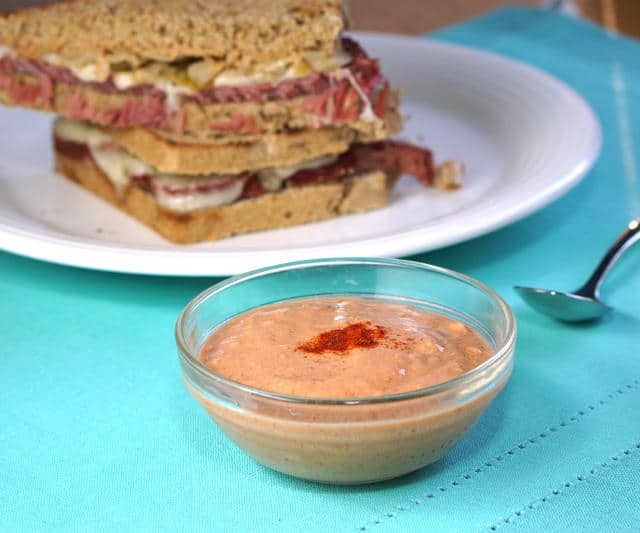 The dressing you choose for your Reuben sandwich is up to you. 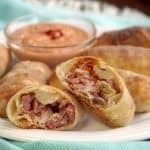 But, even if you don’t have either on hand, it’s really easy to whip up a batch of homemade Russian Dressing with ingredients you probably already have in your pantry! Yogurt, ketchup, horseradish (prepared or fresh) combine with a little garlic and paprika to make this super simple and incredibly addicting dressing. Russian Dressing: it's tangy, slightly spicy, and all-around addicting! 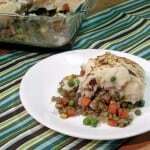 Dressing can be used immediately, but the flavor will improve if refrigerated for at least 10 minutes before using. Store the dressing in a sealed container in the refrigerator for 1 week. So glad you enjoyed the dressing! 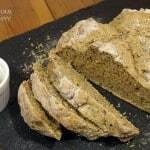 Recipe is great, well done! 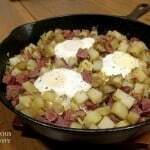 As for the recipe with the sour cream, mom said she would prefer it on a salad and favored the dressing with the yogurt for the Reuben Sandwich. 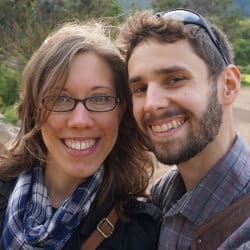 Thanks so much for sharing your test! We’re so glad she loved the recipe. What a wonderful Mother’s Day meal! 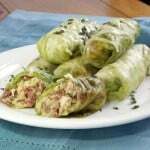 the home made russian dressing is fantastic….love your stlye. I cannot pretend to be as good as New York Deli’s Rueben ,but this is GOOD ! 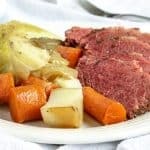 My wife makes the great sauerkraut and ..:corned beef.. So glad you enjoyed the dressing! Thanks for stopping by! We came across the Ruben for the first time recently in the Adelaide hills town of Aldgate in South Australia. They used the authentic Russian dressing too. 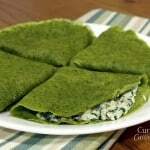 We loved it so much I’m making it for dinner tonight to introduce it to our kids! 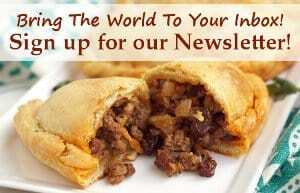 Next week I just might try the vegetarian version as porcini mushrooms are in season here. 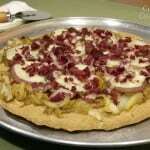 We hope you enjoy our recipe! The vegetarian version sounds tasty as well! You are correct Jack. Russian Dressing was invented in the early 1900s in New Hampshire. Thanks for your comment! Finally! A proper recipie for Russian dressing! All the others call for mayo, but my husband is Russian and his family use so much yogurt, creme fraiche and sour cream, I just know he will prefer a more traditional take on this Russian dressing (no mayonnaise!) so thank you! Thanks Evelyn! We hope you and your husband enjoy the dressing! 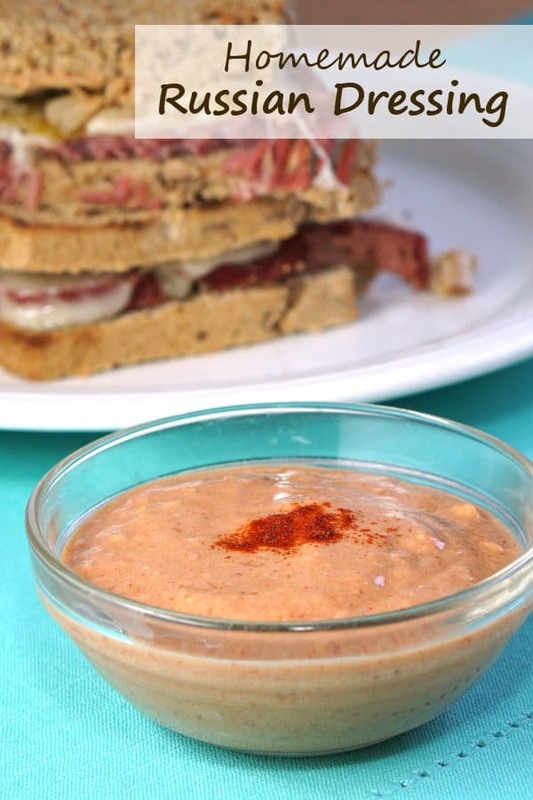 I’m going to use the Russian Dressing recipe with a vegetarian Reuben made with Portabella mushrooms. I had the sandwich at a moderately-upscale pizza chain restaurant and thought it would be something to make at home–and your recipe is the one that stands out. Thank you Brook! Your Portabella Reuben sounds delicious! We’ll have to give that a try some time! We hope you enjoy the dressing!